If you are seeking a long-lasting Men’s Tungsten ring that is extremely durable, scratch resistant, and can withstand even the toughest conditions as it is worn day to night, then tungsten wedding bands are the ultimate choice. Made exceptionally strong with a Tungsten Steel or Tungsten Carbide material, only a diamond or corundum can scratch through the surface, yet so elegant with a touch of industrial appeal combined with modern styling and design that can be specifically tailored just for you and your needs. Men’s tungsten wedding rings have become a trend setter all on their own: for those that want to make a statement in style and opt for a metal other than gold, platinum, or silver, then the tungsten rings are at the forefront. 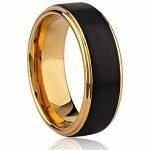 Men’s black wedding bands can be made with engraved or grooved designs featuring a variety of colors making them both a fashion forward selection that is both personalized and timeless. Ideal for everyday rings, wedding bands or gifts for that special someone in mind, men’s Tungsten wedding bands have become the top choice for those who wish to appreciate their tungsten wedding ring for several years to come. At RUDIX JEWELLERY, we specialize in men’s tungsten carbide wedding bands to make your shopping trip complete and satisfactory. Each Tungsten wedding band is custom-made by master jewellers, assuring our clientele that each men’s tungsten carbide wedding ring is unique and meets high quality specifications so each of our customers are happy with their TUNGSTEN JEWELLERY without the hefty price tag. We are proud to offer a large variety of tungsten rings in Hamilton created with a stunning textured brushed finish or colored enamel finish if desired, in addition to being crafted to hug the finger with comfort in mind. From slim to larger widths and From Black Tungsten Rings to Two Tone Tungsten Rings , our Tungsten Rings are suitable for lengthy wear and are made for enjoyment, meanwhile retaining their appearance. Please preview our collection of tungsten rings for men and contact us with any questions you may have. I came to Lux Jewellery with minimal knowledge on diamonds. The different cuts and clarity in which they came in. I felt comfortable enough asking questions and I had great answers that better helped me understand on what I was really looking for. From picking the stone to designing the style of ring I wanted. They worked with me from scratch in designing the custom ring. They were able to incorporate my son's birth stone into the ring. Due to my work schedule I was able to communicate very well through phone calls and emails were usually replied within hours. Overall it was a pleasant experience at Lux Jewellery and my fiancé is happy with her beautiful ring. Thank you!! Great experience. Lux was the first place my fiance' and I looked in our venture to find wedding bands. We loved what we saw but decided to continue looking just in case. We ended up coming back and buying both of our rings from here as they weren't pushy and didn't make us feel uncomfortable like most other jewelry stores did. They have fantastic prices and excellent customer service. The owner of this store spent a lot of time helping me find just the right design for my ring. He was incredibly patient and committed to making sure I was happy - all within my budget. A great experience. The owner was incredibly friendly, helpful and accommodating to all aspects of my experience there. I would recommend Lux to anyone in search of any and all jewelry types. Five stars is hardly enough to give! Soheil helped me design a beautiful pendant for my wife's birthday which she fell in love with instantly. Highly recommend Rudix Jewellery. Great service and reasonable prices. By far the best experience I’ve had purchasing jewelry. I was on my way to another store when I noticed the new store while waiting for an appointment in a parking lot, so I decided to go check out Rudix Jewelry. From the get go Soheil (owner) walked me through the process and stayed within my budget, my new fiancé absolutely loved the final product. On day of pick up and final payment Soheil informed me that he came in under budget; he told me to keep the savings. He could of not told me and kept the extra, so happy to see there is honest people left out there. So please, any jewelry needs go to Rudix jewelry you will not be disappointed. Soheil thank you so much you will see us again for sure. Amazing customer service and products, outstanding knowledge of everything in store. Custom work on the rings is phenominal! Would recommend to friends ans family! This is the place!!! Soheil (owner) is very patient and knowledgeable....been in the business for years! I was shopping for an engagement ring for months, wish I had found Rudix right away as there is no need to go anywhere else! He has a variety of eye popping custom made rings to choose from, or as I did, he can help design exactly what you're looking for, and probably for tge best price out there!!! The ring is absolutely gorgeous and 1 of a kind! My fiancè is in LOVE with it...she couldn't be happier!! We will be back for both our bands, Thank you Soheil for your time and patience!! I purchased a bracelet from Rudix as a valentines gift this year. My wife was very happy with it, and I was very happy with the service I received. Soheil was very easy to talk to, and didn't pressure me into anything. I felt very relaxed and at ease, I will definitely be purchasing jewellery from Rudix in the future. My fiance wanted to customize her ring. After researching we decided to go with Rudix. Mr. Sorkheh was very approachable and his craftmanship was meticulous. He created a beautiful ring that exceeded our expectations and my fiancee can't stop staring at her new ring. We are very happy and would recommend Rudix Jewelery to everyone. From the moment we walked in the store we felt comfortable and zero pressure to make a decision right away. It is worth your money and time! Excellent experience! I had very specific requirements for a ring and I was having a really hard time finding what I wanted in jewelry stores. I decided custom made was the way to go. After sharing my requirements with Soheil, he was able to come up with a design that was perfect. I am very pleased with my ring. Soheil created the perfect ring for us by making a slight modification to another design we liked. Unlike other stores, I didn't feel like he was trying to push us to spend as much as possible, he was just trying to help us find the right ring. I would strongly recommend Rudix Jewellery. Excellent experience, had my grandmothers old wedding rings cleaned and fixed. They look like new now. Offered great customer service. I had an engagement ring made with an old family opal and diamonds from my grandmother's anniversary ring. Soheil made a beautiful ring with the opal as a centrepiece and the diamonds surrounding it and extending on a platinum band. It is breathtaking...and it was well within my budget. I will be proposing on August 31 and I know this ring will take her breath away! I highly recommend Soheil at Rudix Jewellery if you want something truly unique and special. I had an excellent experience designing an engagement ring and wedding band with Soheil. He was very detail oriented and open to suggestions and revisions, and worked with me until the designs were exactly what I had in mind. I'm very happy with my rings. Soheil was also responsive and stuck to timelines he promised. Pricing was fair. I would definitely return for any other jewellery needs in the future. I've already purchased an engagement ring and was very satisfied! Recently purchased our wedding bands and once again Rudix Jewllery did not disappoint. Very kind and informative service. Anything you need done they can accommodate it. Thank you Rudix Jewellery! This place is great! They helped me design the perfect ring. The customer service was excellent. On my first visit i was very impressed with the knowledge and suggestions to repairs on my antique family heirlooms! They will no longer be broken in a box in my closet - i am wearing them!!! Beautiful. I will be back again to work on a creative design with Rudix for a unique design for my great grandmothers' diamonds!!! I highly recommend Rudix Jewellery! We went to Rudix for a custom ring and the owner is fantastic! He used the style ideas that i liked to design my engagement ring, and it is better than i could dream up myself. The service was friendly and fast, reasonable priced, and of the highest quality. We will definitely recommend this place to everyone! Excellent and fast service. Had both my watches repaired in no time. Would highly recommend for all jewellery needs! Contacted Rudix to help me design a custom engagement ring using a family pearl, not only did they help in the design but exceeded expectations! I was very impressed with the personal service and attention. We will be returning for the wedding bands! Wanted to share my very pleasant experience with this wonderful business. I brought a ring in to be resized and it was suggested I could also have the ring rhodium plated as well. I am extremely happy I did, the finished result exceeded my expectations. Excellent customer service and professionalism. I look forward to my next visit and highly recommend this jeweler. First time customer. Superb customer service. The owner took his time helping me find the perfect gift. The jewellery designs he has created are exquisite. Highly reccommend this store. Needed ring resized and watch repaired. VERY pleased with results and turn around time. Will definitely make this my go-to jewelry store!!! Fantastic service. I brought in a watch for repair, it was done very proffesionaly and in a timely manner. Also, made few adjustments to another watch which was great as well. Very proffesional and kind service. Highly recommend the place.